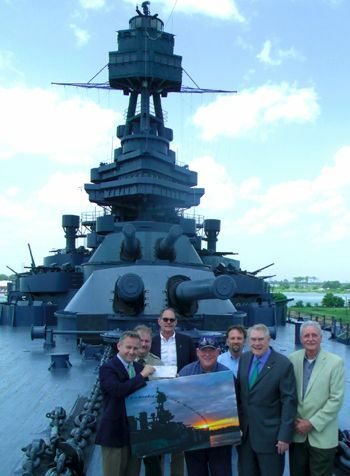 DEER PARKRepresentative Wayne Smith (R, TX148th) announced alongside members of the Battleship TEXAS Foundation and members of the San Jacinto Historical Advisory Board that Anheuser-Busch generously donated $20,000 to the Battleship TEXAS Foundation on Thursday. In 1948, the legislature permanently anchored the Battleship TEXAS near Buffalo Bayou and the Houston Ship Channel at the San Jacinto Battleground State Historic Site. This year the Battleship celebrated its 100th anniversary by honoring the battleship, her legendary history, and paid tribute to the surviving crew members who proudly served on the ship during World War II. While the Battleship has taken on a lot of repairs in the past few years, Rep. Smith remains committed to raising funds to repair and hopefully one day dry berth the TEXAS in its current location. Both the state and federal entities, who are responsible for the ships well-being, are moving forward with a repair initiative to improve the ships overall sustainability and keep her afloat until more funds can be raised to permanently dry berth the ship. Thursday, a special crew of restorationists and machinists were repairing the 40 m.m. antiaircraft weapons while answering questions of visitors. I want to recognize and thank the numerous individuals and organizations for their generous and continued support of this project,+h said Rep. Smith. I also want to thank Governor Perry for his leadership in appointing members of the local community to the Advisory Board as they have had a big hand in supporting this cause with me. Jimmy Burke and Calvin Mundinger both former Mayors of Deer Park and Baytown have a long intimate relationship with the Battleship and I believe it is imperative that we continue to keep our local leaders and community involved in the preservation of this ship so that our future generations will be able to visit and continue to enjoy this national treasure like we have been blessed to do. Smith said. Representative Wayne Smith represents Texas House District 128, including Baytown, Deer Park, La Porte, Crosby, Highlands, Morgans Point and a portion of Pasadena. CROSBY  A piano played and fountains of chocolate ran as local dilettante viewed the works of local artists inside the Crosby Community Center Friday between 5:00 p.m. and 8. Aesthete were treated to taste and visual artistry as well as fine accompaniment of music. This years connoisseurs treat were not only visuals of oil and tempera but also statues and carvings accented by a solid wooden piece replica of the Sacrament of the Last Supper made by a Prisoner of War prior to World War II in a wooden medium with wood fragments finely carved to resemble Leonardo Da Vincis 15th Century 15 by 29 feet masterpiece. The most reproduced religious image of all time that portrays indefinable emotions.Malcolm Butler purchased the meter wide replica about 50 years ago in Occupied Germany. The displayed art will be visible until Friday of this week. 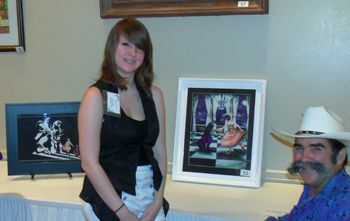 Also included were the hand carved works of Jim Logsdon, Doug Humphrey and Bill Fehr.